The high-performance air-adjusting type CO2 incubator integrated many-year manufacturing technology and experience of our company. It is developed with the introduction of new techniques. 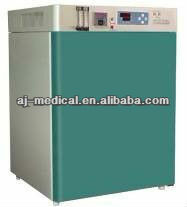 Compared with common CO2 incubator, this type provides faster heating and less errors of temperature precision. 1. It is made of specular stainless steel (or wire-drawing sheet)by argon-arc-welding techniques, and semicircular arcs at corners ensures easy cleaning. 2. Microprocessor temperature controller makes temperature stability. 3. Independent alarm system for temperature-limiting ensures experiments run safely and no accident would happen. 4. Door temperature controller prevents dewfall on glass door of incubator effectively. 5. Microorganism filter at inlet provides 100% filtrated gases.